This fall I've decided to start a new weekly cocktail series that will be all things fall...plus impress friends & neighbors. 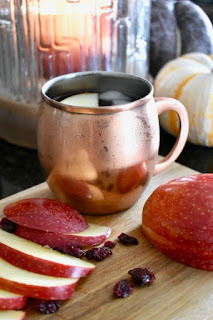 To start off the series I chose one of my favorite drinks but added a fall twist! Okay all you Moscow Mule lovers...this one's for you! Fill your copper mug with ice, add a shot of vodka, 1/4 cup cranberry juice, 1/2 sparkling cider and top the rest with the ginger beer. Add in a few cranberries and an apple slice. Stir. Enjoy!